Maryland Gov. 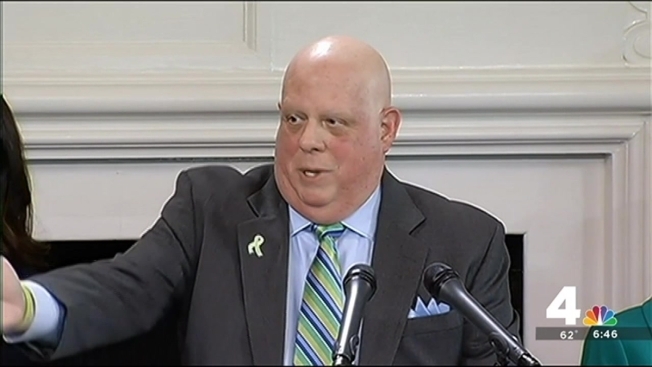 Larry Hogan announced Monday he is "100 percent cancer free and in complete remission." "I truly am incredibly thankful to be standing here with you again," he said. Andrew Oberle ran up in the middle of Hogan’s press conference at the statehouse to give him a hug. The 5-year-old boy also is fighting cancer and met Hogan at a children's cancer event. The little boy gave him a handwritten book with some tips for coping with cancer and some drawings, starting a special friendship. "He told me to keep my hugging person with me when I'm down, along with nine other great pieces of advice," Hogan said. Hogan, who was diagnosed with B-cell non-Hodgkin lymphoma in June, finished his final round of chemotherapy Oct. 13 at the University of Maryland Medical Center. Hogan will continue to get scans on a regular basis and undergo preventive health maintenance. He was diagnosed with B-cell non-Hodgkin lymphoma in June, five months into his first term as governor. He called it a “very aggressive” and “very advanced” form of cancer in his lymph nodes. The Republican, who won an upset victory last November in the heavily Democratic state, said he had noticed a painless lump along his jaw before he was diagnosed. He also felt some back pain, which he said was caused by a tumor pressing on his spinal column. Last month, he completed 30 days of 24-hour chemotherapy, as well as three surgeries, four spinal taps and countless scans over his four months of treatment. He remained active during his treatment. Monday morning, Hogan shared an editorial he'd written for the Washington Post, titled "Live Like You Were Dying." "I have read every single note," he wrote in the Washington Post editorial, which was published Friday. "I have teared up over the 'get well' artwork that schoolchildren tucked into bursting envelopes. Country star Tim McGraw even dedicated a performance of his song 'Live Like You Were Dying' to me." Hogan continued, "Such acts of kindness have kept me strong and my spirits high, and they're undoubtedly among the reasons I'm on the road to recovery. Having a support system while undergoing cancer treatment is necessary. I am eternally grateful." Hogan has displayed an optimistic outlook and sense of humor through his treatments. After losing his hair to chemo, he said the Annapolis State House now had "another white dome." And two days before Halloween, he shared photos edited to depict him as two bald icons: Mr. Clean (with the caption "Cleaning Up Annapolis") and Capt. Jean-Luc Picard of "Star Trek: The Next Generation."